Your new house is finally starting to feel like home. Various decorations inside have brought each room to life. Now, it is time to build your outdoor look. You don’t have to pour a lot of money into outdoor furniture or designs. It can be done cheap while looking professional. Here are some ideas of what you can use. If you already have items outside there are some things you can do to spruce them up. Like placing a colored rug under the furniture. This can easily make it look better. Try using a few lanterns here and there to lighten the area with a soft glow. You can even make your own lanterns with empty cans. An alternative to this, get a string of lights and make a trail of sparkles. The floors of the deck can use a new coat of paint to vitalize its visual appeal. The same will be accomplished by covering an old table or chair with a vibrant colored tablecloth. This small hint of color can be enough to visually bind the old furniture together. The advantage of pallets is that it can be made into anything you are willing to try. They are also cheap and easy to find. Go to a local wholesale store and ask if you can purchase a few for a low price. Finding one in a dumpster is another way if you don’t mind getting dirty. Another alternative is utilizing old tires. Spray a coat of paint over them and place some nice pillows inside for a clean chair. Tie a few together to make a stand. Those old tires in storage can finally be put to use. Instead of throwing out your old furniture use it for outside. Cover any dingy areas with blankets or sheets. It will fit right in and you won’t have to worry about dumping large couches. A surprising amount of people decide to throw away their furniture when it is scratched or has any cracks or tears. These are easily salvageable, just cover those unpleasant spots with colorful blankets or tablecloths. If these options do not fit your needs, then check online for cheap prices on used furniture. There are plenty of stores that sell used goods which can meet your budget. Do not worry about mixing these ideas together. You may think a tire chair will not fit with a pallet bench, but it will. Mix and matching different types of furniture can define each piece more, attracting attention to the various styles. 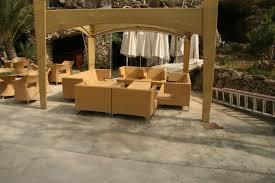 Designing your outdoor furniture can be an awesome experience! It is the final touch to a home: Have fun with it!